When you dream of saving plants for a living, you don’t expect to wait for tribal elders to rule on whether you can get started…or to sleep in the sage-scented high desert on your first camping trip ever…or to walk through the woods to spray your hand-raised seedlings with a deer repellent that smells likes rotten eggs and garlic. But when you are driven by a passion for plants, you do whatever it takes to move forward, said three alumni of a graduate program offered by the Chicago Botanic Garden and Northwestern University. The two institutions combined their resources in 2005 to offer a unique program in plant biology and conservation; the program marks its tenth anniversary this year. 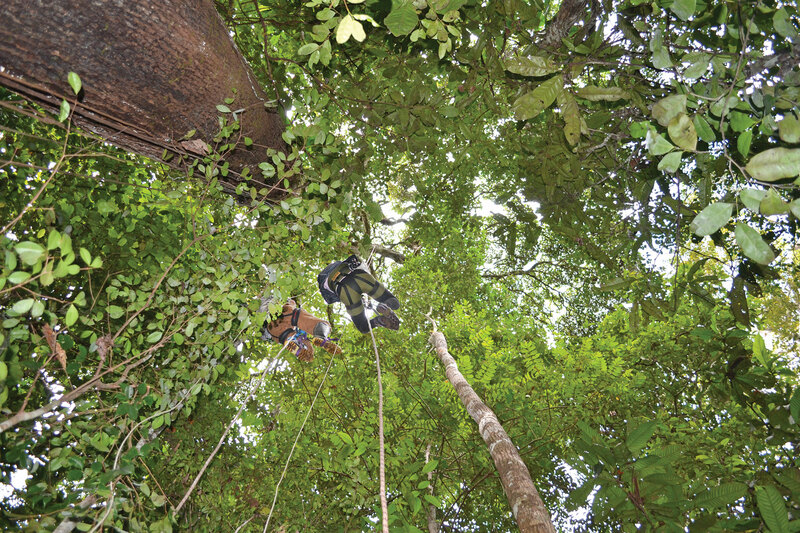 Tracy Misiewicz climbs into the canopy of a tropical rainforest to collect data on pollination. Students take courses at both the Chicago Botanic Garden and Northwestern University and work with researchers and faculty from both institutions. Alumni of the graduate program—which includes a doctoral track—are working for nonprofits and agencies including the Field Museum, the Morton Arboretum, and the U.S. Environmental Protection Agency, and participating in research projects in places including India, China, and Malaysia. Program graduate Tracy Misiewicz in the field. Tracy Misiewicz’s research project was on hold, while the village elders poured fermented rice wine into the ground. During the ceremony, in the western mountains of Cameroon, the elders chanted in Bakossi, a Bantu language, asking their ancestors if Misiewicz—a native of Maryland who decided to become a scientist in the seventh grade—could enter the rainforest. Then the elders threw down a handful of cacao nuts to see if they would land in a certain order. They did; the ancestor had granted permission. And that, recalled Misiewicz with a delighted laugh, is how she began her fieldwork in Cameroon. 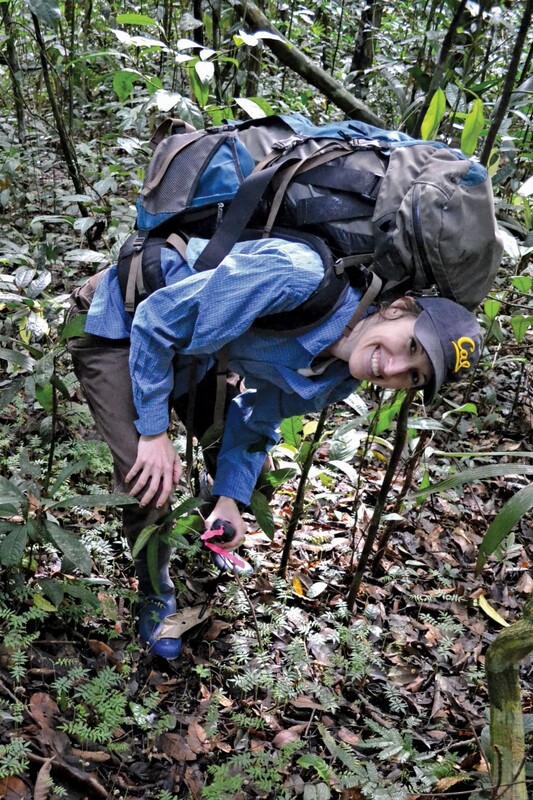 With her sister as a research assistant and their Ngomboku neighbor—a basket weaver—as a guide, Misiewicz trudged through the forest to look for Dorstenia, the second largest genus in the moraceae (mulberry) family. Dorstenia species—some of which are considered threatened or are already extinct—are used by indigenous people for medicinal purposes and show promise in their use in modern medicine. As part of her master’s thesis, Misiewicz looked at the family tree and evolutionary history of some species within the genus. 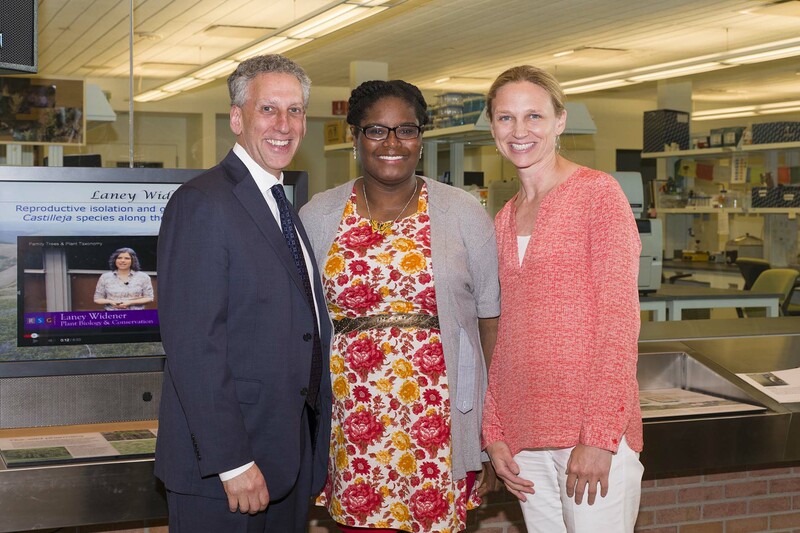 Program graduate Alicia Foxx with Northwestern University Provost Daniel Linzer, and Chicago Botanic Garden President and CEO Sophia Shaw. Alicia Foxx hit the ground running when she started her master’s degree program, under the supervision of Andrea Kramer, Ph.D., a conservation scientist at the Garden. “The second time I met her,” recalled Foxx, “we were getting on a plane” to work on a research project in the Southwest. The two of them drove and camped in the high desert of the Colorado Plateau, which covers parts of Utah, Colorado, New Mexico, and Arizona, including the Grand Canyon. Foxx, a native of Chicago, had never slept outside or seen mountains before. And she had never seen the way that invasive species could choke out native plants, including bunch grasses and wildflowers. Foxx was accepted into the Garden’s master’s program and, in June 2012, made the weeklong trip with Dr. Kramer to the Colorado Plateau. With a team of researchers, they gathered the seeds of promising native plants—those tough enough to thrive in harsh conditions—as part of the national Seeds of Success collection program. For her master’s thesis, Foxx studied native species that may be able to compete with cheatgrass (Bromus tectorum), an invasive species in the Plateau. Now, she is a doctoral candidate in the plant biology and conservation program. “I am so excited about working at the Garden for another five or six years,” she said. On some days, especially in the summer, she gets to the Garden an hour early to visit favorite spots, including the English Walled Garden. Program graduate Byron Tsang working in the field. As an undergraduate at Northwestern University, Byron Tsang—now a project manager and ecologist with the Chicago Park District—was a chemistry and biology major. Tsang, who grew up in Atlanta, thought he might go into some sort of disease research, specializing in immunology and diagnostics. But something else tugged at him. With a passing interest in ecology, Tsang took some field ecology classes and volunteered to work on the North Branch Restoration Project. (The organization helps protect and restore native Illinois ecosystems along the North Branch of the Chicago River.) And on vacation in New Zealand, he happened to learn about a challenging ecological problem—a common weed was taking over pastureland needed for sheep. When he finished his undergraduate studies and decided to pursue a master’s degree, Tsang had settled on a new field: plant biology. “I thought, ‘Hey, I could actually do this for a living,’” Tsang recalled. Tsang wasn’t sure what his master’s thesis would be about, but he knew that he wanted to focus on a local problem. “I ended up falling in love with midwestern ecology,” he said. His adviser, associate conservation scientist Daniel Larkin, Ph.D., steered him to the Garden’s Jim Steffen, a senior ecologist. Steffen, who is leading restoration efforts in the Garden’s McDonald Woods, mentioned an intriguing question: why had two native wildflowers—pointed-leaf tick trefoil and violet lespedeza—failed to take off in the Woods? (The two legume species had been able to grow in other area oak woodlands; both are indicator species that appear in healthy woodlands.) Tsang took on the question as his master’s thesis; as part of his research, he sprayed young seedlings in the woods with a smelly deer repellent. Tsang’s connection to the Garden has continued in his work for the Park District’s Department of Natural Resources. 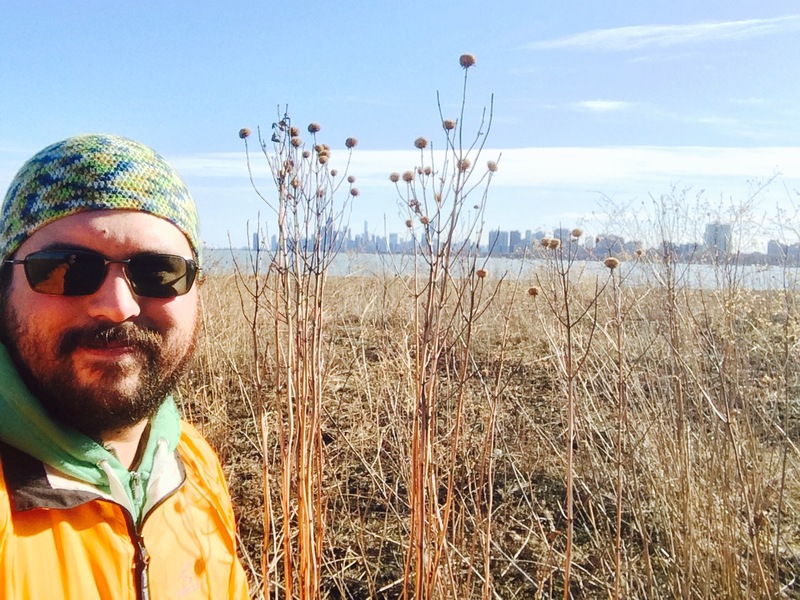 When he heard about a Garden project to evaluate urban nature pockets—as part of its Research Experience for Undergraduates (REU) program—he realized that the Park District had a similar goal. This summer, he hopes to work with an REU intern in the Park District’s natural areas. Renee T. is an editor at the Chicago Botanic Garden. View all posts by Renee T.